It was more than 20 years since I'd last seen Warner Hodgdon. But there he was, walking quietly, purposely as always, through the NASCAR garage at California Speedway, on a bright and sunny spring morning. Few if any would have recognized Warner. In this sport things can change dramatically in 20 days, much less 20 years. In life too, as Hodgdon himself could too easily agreed. The hair was California silver-white now, no longer the fiery black. The powerbase, as a major league Southern California real estate developer, was long history. Yet this day Hodgdon stood out as distinctively patrician as ever. Even when just standing alone, Hodgdon would put his hands on hips in that classic defiant, let's-get-it-done style, impatient. However the voice that morning was much softer, certainly more gentle than I'd remembered. Of course remember the relationship between NASCAR journalist and NASCAR team owner, back in the day, was sometimes, ah, contentious and argumentative. Now, this sunny day, the great memories of his years in NASCAR were still vivid to both of us...though the pain of what all had happened in the intervening years to him was too clear. But this wasn't a day to talk of the pains. And it isn't today either. Warner Hodgdon, once one of the most powerful, flamboyant men to walk these garages, died this week, at 80. He was a man ahead of the times, a man who saw what NASCAR's future could be. He just ran out of time to make it all happen. Hodgdon wanted to write a book about it all. We just never seemed to make that happen either. He may be one of the many deserving men who won't make it into this sport's Hall of Fame. Hodgdon's politics were, well, feisty. But if becoming a legend in NASCAR means having changed things big-time and in fashion, Warner Hodgdon certainly deserves a place. Yet the number of men who can still remember those heady days, back when this sport was much more fun and exciting, is down to a precious few. Les Richter, the long-time Riverside Raceway boss who lived just down the road from Hodgdon, could perhaps best talk about him..but it's been nearly three years since Richter passed on. During Warner Hodgdon's years in this sport, from the 1970s -- when the then little-known San Bernardino businessman put his name on a Riverside Raceway event, and helped Bobby Allison through those Matador days of 1977, and helped Benny Parsons and Donnie Allison in 1975 tour races -- through the tumultuous climax in 1985, Warner Hodgdon changed things. Warner Hodgdon made things happen. In his Southern California world, Hodgdon is best known as a major league real estate developer. To promote that business he turned to racing, logical given Riverside Raceway was only minutes away from his home. After dabbling in Indy-cars -- with 'the Spirit of Public Enterprise' sponsorship in the Indianapolis 500, and with American Motors' stock-block Indy engine project -- Hodgdon quickly turned to stock cars. He may be best known now for bringing alive the now ubiquitous multi-team operation, buying into Junior Johnson's team, and pairing Neil Bonnett with Darrell Waltrip for 1984, 1985 and 1986. Hodgdon helped Johnson expand the operation, and he even built a helicopter landing pad next to Tilley's country grocery, just across the road from the Johnson shops. Hard to land that Lear up in Ingle Hollow. But Hodgdon did much more. He helped the Wood brothers continue thriving, after the switch from David Pearson to Bonnett. And I still remember how giddy the Woods were about those flights in Hodgdon's jet; 20 minutes home, instead of six hours on the road.. He helped Butch Mock and Bob Rahilly get on the NASCAR map. More help for the sport's little guys. 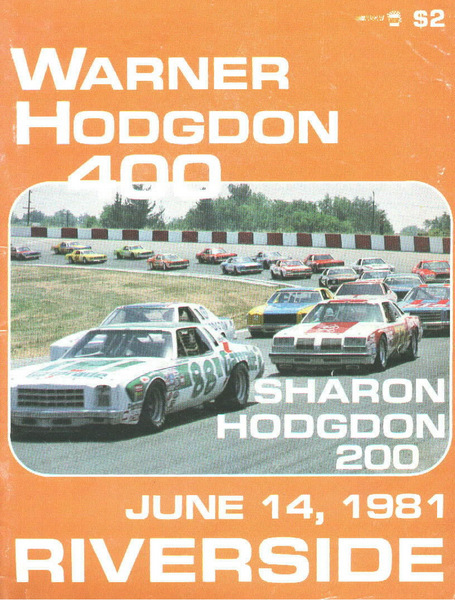 And Hodgdon, perhaps unknown to many, helped sponsor Dale Earnhardt during his 1980 championship season, working to put Wrangler on the quarterpanel. Hodgdon also helped keep Richard Childress running, back when times weren't so good: "Warner was a great friend and partner who helped change the landscape of NASCAR team ownership. I learned a lot about business from the advice he gave me over the years. "He was there to help me with sponsorship from Black Gold when I really needed it. "Warner was an entrepreneur with a great vision for where stock car racing could go, and we stayed in touch long after his time in racing ended. "He was a great friend and will be missed." Hodgdon also worked with Allison during his AMC Matador years. He worked with Allison and Bud Moore (1979) through some difficult times. All this back when big-buck sponsors simply didn't exist in this sport. Some people get into this sport to promote themselves. Hodgdon got into it to help the underdogs. Hodgdon was not bashful. He was not patient. He made things happen. He was perhaps the first man to realize the potential clout of owning a portfolio of big race tracks. 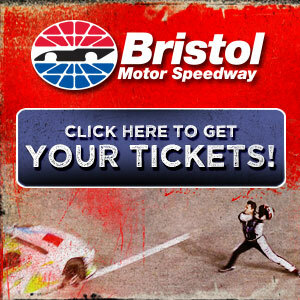 He bought into six key NASCAR tracks in the early 1980s: Bristol, North Wilkesboro, Nashville, Richmond, Phoenix, and Rockingham, and he made a bid for Darlington too. This, remember, was long before the 1990s surge in big track construction. No Las Vegas, no Kansas, no California, no Sonoma, no Kentucky, no New Hampshire, no Chicago, no Homestead-Miami. Even Watkins Glen was still just a glimmer on the horizon. Hodgdon was not shy either. At Phoenix Hodgdon even put his son Aaron, then just 14 years old, on the board of directors. He put his wife Sharon's name on a race. He put his own name on races at Rockingham. Hodgdon's mainstay was his company National Engineering, which handled financial services for the City of Industry, the business-oriented town built on once curious farmland just west of Ontario/Fontana. Hodgdon put 'National Engineering' on virtually all his NASCAR stockers. When Hodgdon teamed with Johnson in late 1982, the Wilkes County legend was at a zenith. Johnson had won five of the last seven championships, three straight with Cale Yarborough, two straight with Waltrip. Hodgdon's infusion of capital was key to helping Johnson take it all to the next level. 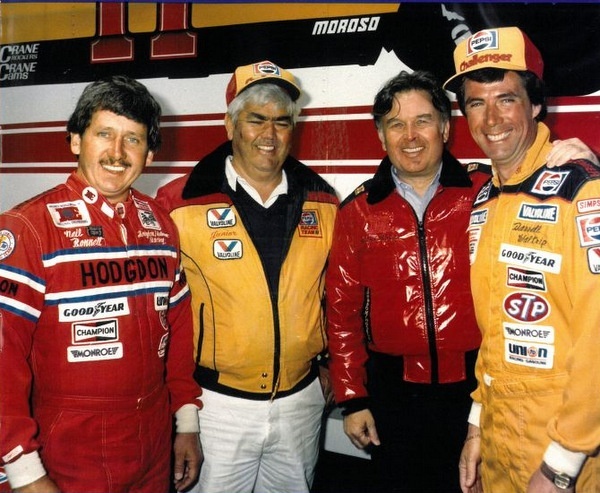 And the success of the Johnson-Hodgdon-Waltrip operation in 1983 (Waltrip narrowly lost the championship to Allison, that after Waltrip's devastating Daytona crash in early season), followed by the expansion to a two-team effort in 1984, led quickly to Rick Hendrick's leap into the fray, with his own multi-car team. This sport hasn't been the same since. However the Waltrip-Bonnett pairing didn't really go as well as everyone had hoped. Waltrip didn't like sharing the spotlight with Bonnett. However Bonnett was much of the key to Hodgdon's NASCAR game, coming along through seasons with Mock and Rahilly and the Woods. Submitted by Tony Geinzer on Fri 03/22/2013 - 17:40. If that was me and I had to paint this country all over again, I would prefer Nashville, North Wilkesboro,Atlanta or Birmingham with Short Ovals. Fontana could not be in racing next year and Southern California is still sans a permanent circuit home that is not quarter mile (Pomona) or Street Race (Long Beach) and it took Riverside a decade to recover their economy after the Speedway closed in good times, and I do feel that we can't rush Road Racing, and I don't mean Austin. Submitted by jim cowan on Sat 03/23/2013 - 07:11. Your comments come as a refresher to those who knew him. I have completed a lot of research on him and his company, and the sponsorships as well as the involvement in Indy and NASCAR that you have indicated in your article. He was a great man whose light shined too early. My condolences go out to his family and close friends.